I am on a roll with salads. Be prepared for many more salad recipes til the end of the Summer. They are my favorite thing to make and eat. Plus when you have such fresh local produce it makes the salads taste so much better!! Several of you asked about my CSA basket and I have to say I am loving it. I use Rosebanks Farm and it has been so fun each week to see what we will get. Everything has been incredible and full of flavor. 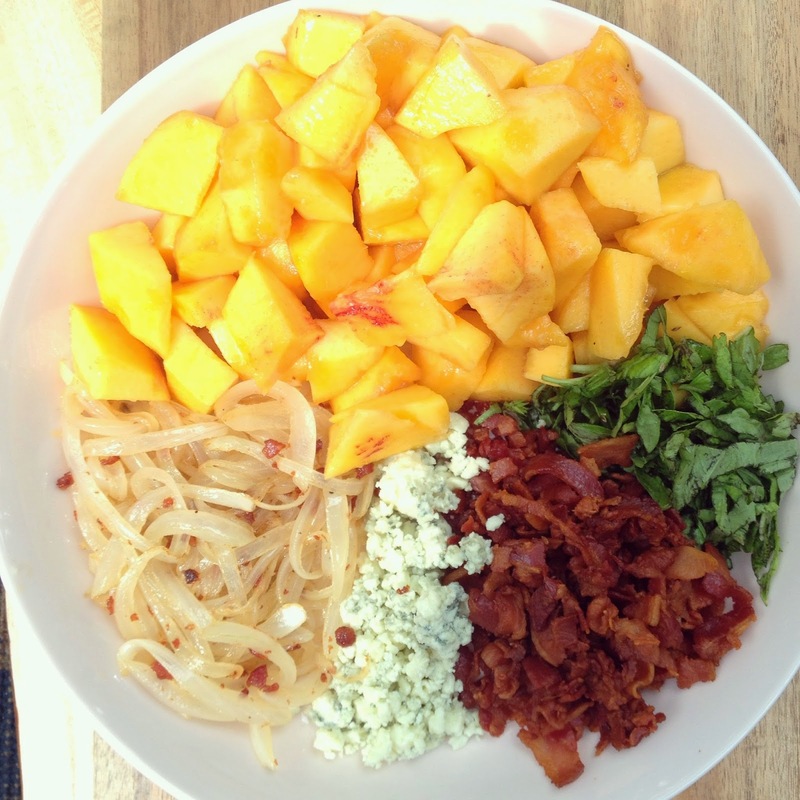 This week we got about 10 peaches so I was trying to think of something to do with some of our peaches and invented this salad. It is so amazing, my favorite summer salad yet. 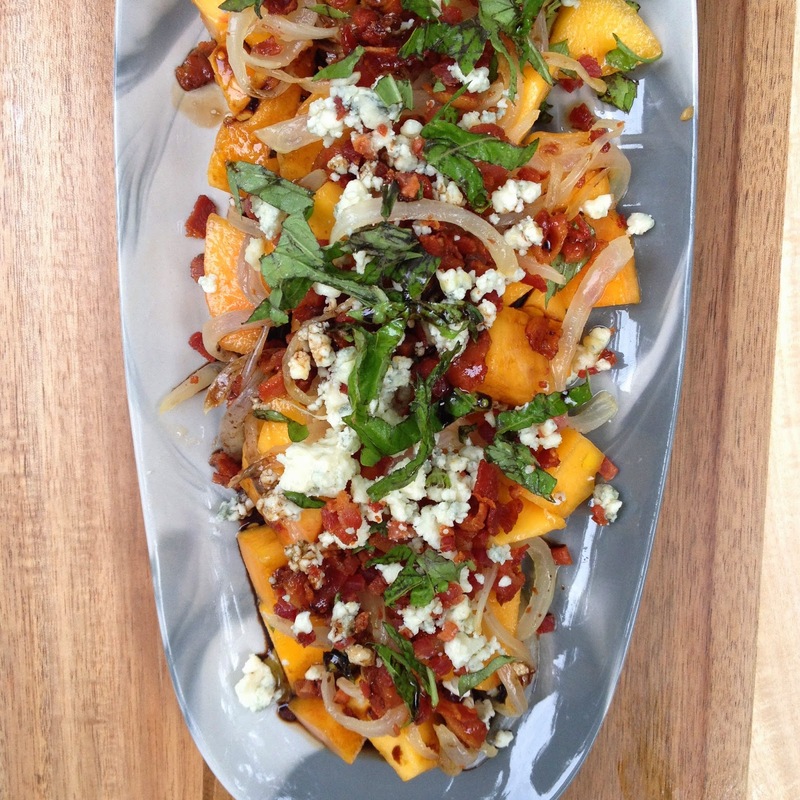 The crispy pancetta and creamy gorgonzola pair perfectly with the peaches. This salad is only good with ripe peaches if the peaches have no flavor this would be a sad salad, so buy accordingly. I have to add I always buy my meat fresh sliced from the deli counter, I think it is so much better then the prepackaged kind. So if you can buy the pancetta from the counter- you could also sub bacon or prosciutto. This salad is best served room temperature. I make a similar topping for pizza and it is so good! will have to try your recipe! This reminds me of our lunch salad last week! Looks amazing! Can't wait to try this! Looks delish!